At Gemma’s Health & Beauty Spa, we believe in the philosophy of Thalassotherapy which is why we only stock and use Thalgo products. Experience and mastery of the sea have placed Thalgo at the forefront of International Spa Therapy. Since its creation in 1968, Thalgo has become a worldwide recognised brand. Cosmetic research and formulation of Marine Algae and plant based cosmetics by Thalgo began in 1964. The Marine Algae powder, awarded both a medical and process patent, gave outstanding results in the treatment of conditions such as rheumatism, arthritis, and skin disorders, and its success has inspired the Thalgo team to branch into the cosmetology field. Thalgo treatments draw their richness and efficiency from the marine universe. Their scientific team have developed a unique know-how in harnessing the powerful riches of the sea for aesthetic use. The sea is the cradle of life on earth and constitutes an immense reservoir of substances that are only just beginning to be realised scientifically. Algae are the base of marine care. Their active potential is immense: for example, one alga contains a thousand times more iodine, one hundred times more calcium and ten times more magnesium and copper than a terrestrial plant. Due to a unique patented manufacturing procedure the cells of the Thalgo marine algae are literally exploded to liberate their active ingredients. The fineness of the powder obtained assures remarkable penetration for use within the Thalgo treatment programmes, now used extensively in Spas and Thalassotherapy centres world wide. Thalgo offers a comprehensive range of professional salon treatments for face, body, aroma-phycology, hydrotherapy, sun care and post-depilatory. Thalgo is only recommended by professional Beauty Therapists and is not tested on animals. For thousands of years the power of marine therapies has been renowned for their dramatic effects in revitalising, rebalancing and healing the body. Today, throughout the world, the finest destination spas and beauty salons offer Thalgo treatments and spa therapies. Immerse yourself in the world of Marine Therapy. 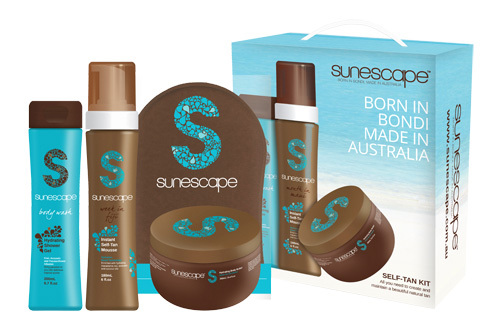 Sunescape products are formulated to provide a natural looking and feeling tan, and one that smells amazing. They contain added vitamins, antioxidants and oils to nourish skin, as well as anti-ageing, hydrating and firming ingredients to leave skin smooth and replenished. The proprietary professional formula uses Ecocert approved DHS, not tested on animals, and free from alcohol, parabens and petrochemicals. A perfect product to get that sunkissed skin we all crave without having to damage our skin in the process.